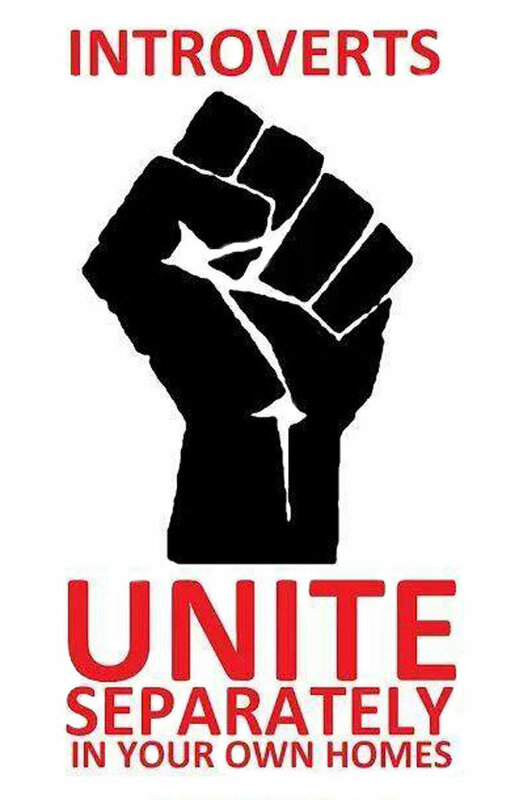 Introverts, Unite! …Separately. …In Your Own Homes. Yeah, I wish I could take credit for that title, but I know I really can’t. I’ve seen the image floating around for a while now and it’s always made me smile. I’m a major introvert, and always have been. Likely always will be. But I’m in a situation now that I’ve never been in before, and it’s going to make the introvert in me very, very unhappy. See? This is the picture I was talking about. As I’ve mentioned in a few posts now, I’m no longer living in the Finger Lakes. I’ve moved “down south” as it were, and I’m living just outside Richmond, Virginia now. I don’t know anyone here except for my parents. And while I’m an introvert, I do like having friends that I can hang out with in person, but I’m not very good at meeting people and I don’t know how to go about it all that well. So I went and checked out Meetup.com. My parents have had a bit of luck with Meetup and finding other like-minded people, so I figured why not? I’m exceptionally bad at meeting people. And lo and behold, there are several writer’s groups here in the area. I’m thrilled. I haven’t had a chance to really check them out yet, but I’m looking forward to it. 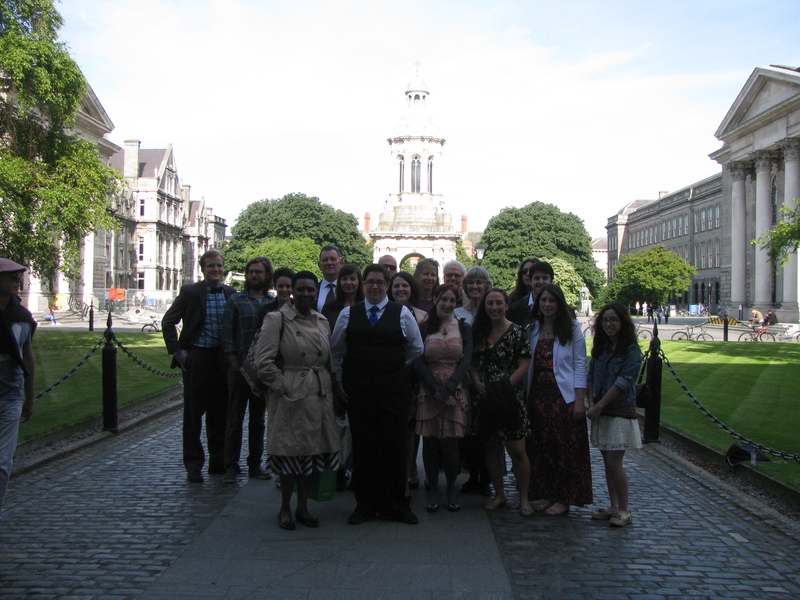 The group at my last residency in Dublin, Ireland. I’d often wanted to start a writing group of my own, back in the Finger Lakes, to follow after the group my father and I put together back in Jamestown to work with NaNoWriMo. It’ll be interesting to see if any of the writers’ group around here do the challenge, or if they’e even heard of it. I’m looking forward to meeting with a few of the MLs from around here and seeing if I can help them in any way. The important thing to keep in mind here is, I believe, that we are not an island unto ourselves, as the quote I think goes. We’re people, and people by nature are social creatures. Some of us are less social than others, and that’s entirely okay. But every once in a while, it’s nice to go meet some other people. Maybe not a lot of people, and maybe not for long. But see if there’s a writing group in your area. See if there’s any interesting Meetups. Get in touch with your local NaNoWriMo ML and see if you’re going to have write-ups in your area. If you’re not, see if you can host one. Most of the MLs I know are always thrilled to have people step up and help. Just start your own writing group and put an ad in the paper and see who comes. Are you involved with any local writing groups? What are your thoughts on being anti-social socialites? Let me know in the comments! Funny thing? I’ve been considering doing exactly the same thing – finding/starting a writing group around here. Eek Eek Responsibility! Okay, now I just need some writers & a place to meet. And and and an idea. As the resident extravert, maybe I should check this Meetup thing out. Do it! Literary Fusion started with me and someone I met at a NaNo write in. In fact, many people from those write ins are members. They’ve become an incredible resource in my writing. NaNo makes it easy because you meet a bunch of like-minded people. Then you really just need to decide a date and place, maybe put up a Facebook group for communication, and boom! I hope you find a good writers’s group! One of my roommates is using Meetup to start a karaoke group here and they’ve had some delightfully awkward people show up. As for my own writing community, I was lucky enough to have been invited to join a small writing group started by a few friends. We’re trying to re-configure now because one of our members moved (to Texas) and another just moved to a different part of town, but it’s nice to have a set time to meet, do a little writing, and get critique. Speaking of NaNoWriMo, what’s going to happen with the NY – Elsewhere group now that you’re out of state? I really appreciated the virtual write-ins last November since my introvert self doesn’t always like heading out into the cold to go to physical write-ins (where it’s sometimes awkward to try to find people).